Bozteck VENM Remote Desktop Manager has introduced a few significant changes in the RDP tabs in version 2016.5.1. Below, you will see an overview of each of them. 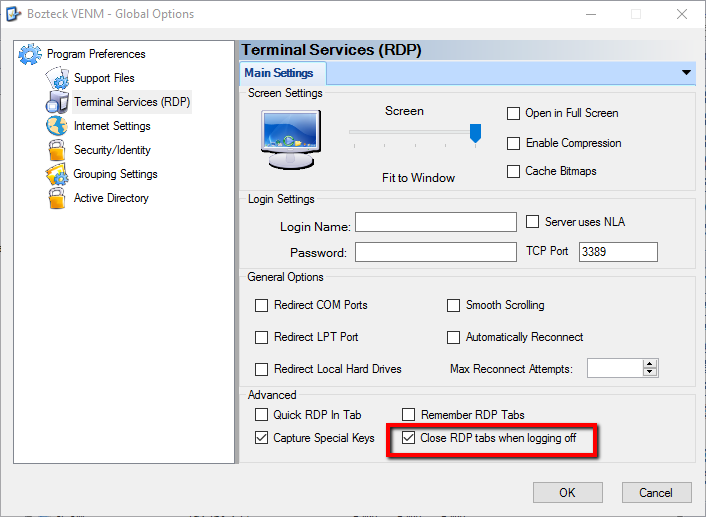 You can now select this check box in the main program preferences to tell VENM that you’d like the selected RDP tab to close when you are logged off the remote desktop computer. This has been requested my many VENM users. It is off by default. We’ve all experienced the super busy day when we have 30 RDP tabs open as we are performing sweeping tasks across all of our servers. Closing all of those tabs has been a tedious one-by-one task when you were competed with the servers. I know that it’s not a huge thing but it makes it a little easier to be able to close all of them with one click … so there it is. This menu item will send a shutdown call to the remote computer over the network. This is using the standard Windows facilities for shutting down computers remotely so it does require that you do not have a firewall blocking the standard Windows management ports and that you have Administrator level access on the remote computer (or at least delegated permissions to issue a shutdown). There have been requests that the name of the server that the RDP tab is hosting be displayed somewhere prominent so that you can tell at a glance the name of the computer that you’re about to perform an operation on. The name has always been in the tab title but it’s not always easy to read and sometimes not even visible depending upon how many tabs you have open. It will always be in the toolbar on the far right from now on. 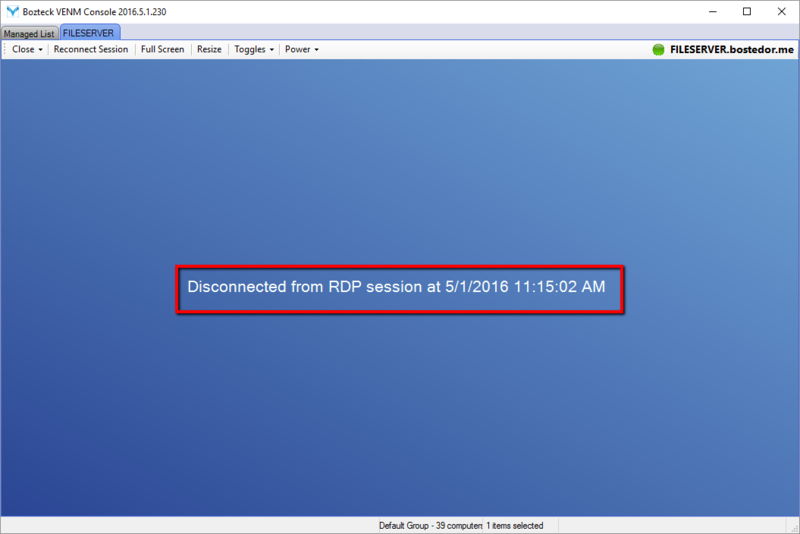 This is a simple update to the RDP tab that will tell you the date/time that you are disconnected or logged off. One final small change in this release was to set the SecureVNC DSM as the default encryption module for UltraVNC when you choose to encrypt the communications. The older DSM that is available as an option is less secure and more problematic. Many of these changes have been requested by IT Pro’s like you and we listen. Sure, we create Bozteck VENM features to suite our own needs as System Administrators all of the time but it’s so much more fun to add features or updates that make your life easier or answer a need that you have. If you have an idea or something that you’d like VENM to do for you, please leave a comment below and I promise that it will be responded to and will probably make it into the product in some form or fashion. This entry was posted in Announcements, Blog and tagged RDP, rdp tabs, remote desktop, remote reboot, SecureVNC, tab, ultravnc, venm, vnc, vncscan. Bookmark the permalink.